Some historians believe that her stay on the island was rather short, and she spent her days in thr crypt at Rabat, in prayers and teaching the Christian Faith to the children. After some time, Agatha realized that it would be better for her, to return to her native land and witness for her faith there, even at the risk of martyrdom. Our fore-fathers dedicated in her honour the same crypt where she used to pray and named after her a nearby Catacombs and later on a Church over the crypt. When Mgr Lucas Buenos was bishop of Malta (1664-1668), he visited this sacred place, and donated to the crypt an alabaster statue, representing the saint undergoing her martyrdom. 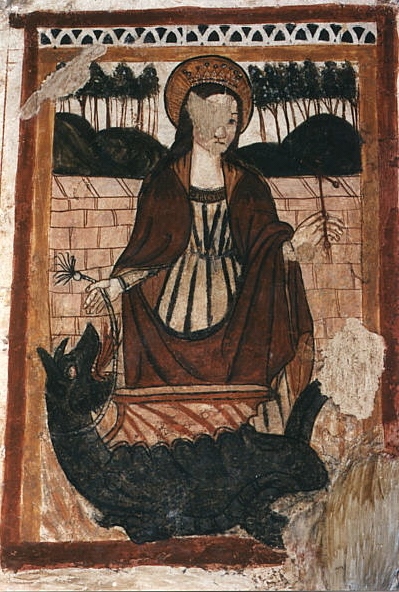 It is a fine work of art, sculptured in Trapani, and represents the Saint tied to a tree trunk and a small puttino is holding a crown of roses above her head. The statue is set on a baroque pedestal within which, there is a tiny statue of the Saint put on fire. Nowadays, this statue could be admired in the Museum. In its place, there is a new fibre-glass statue of the saint, the work of the Maltese artist, Anton Agius. 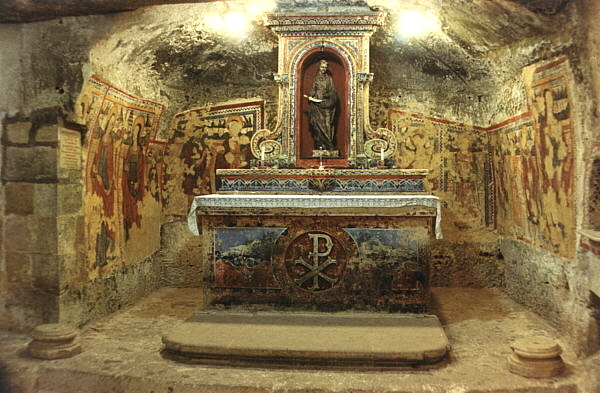 The crypt is adorned by a good number of frescoes. Some of them date back to the 12th cent ury and are in Byzantine style. The others, which are in Greek style, date back to the 15th century (1480). 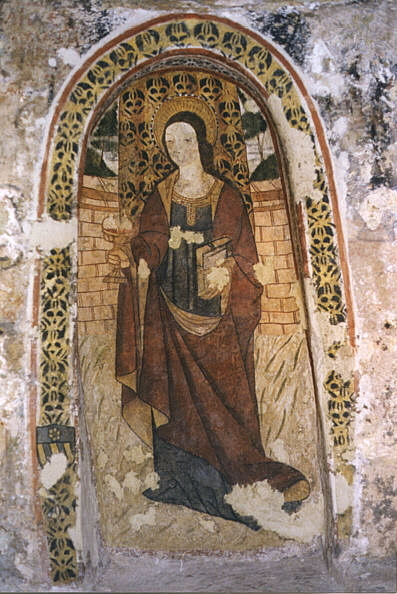 There are 30 images of saints, out of which, 13 represent St. Agatha. 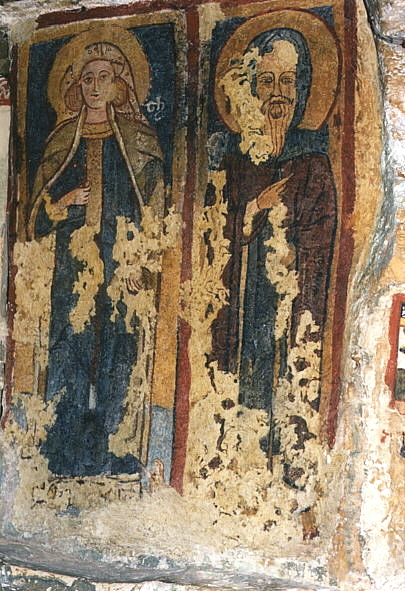 The remainder represent bishop saints, virgin and martyr saints.The 15th century frescoes are attributed to the Sicilian painter Salvatore D'Antonio. These were donated to the crypt by various devotees, offered in thanksgiving. 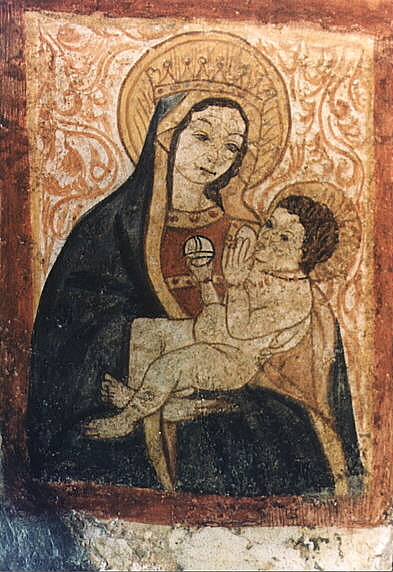 Other paintings are still visible in the ceiling at the entrance on the right hand.